Whew! That gave me a bit of a fright! Adams et al. 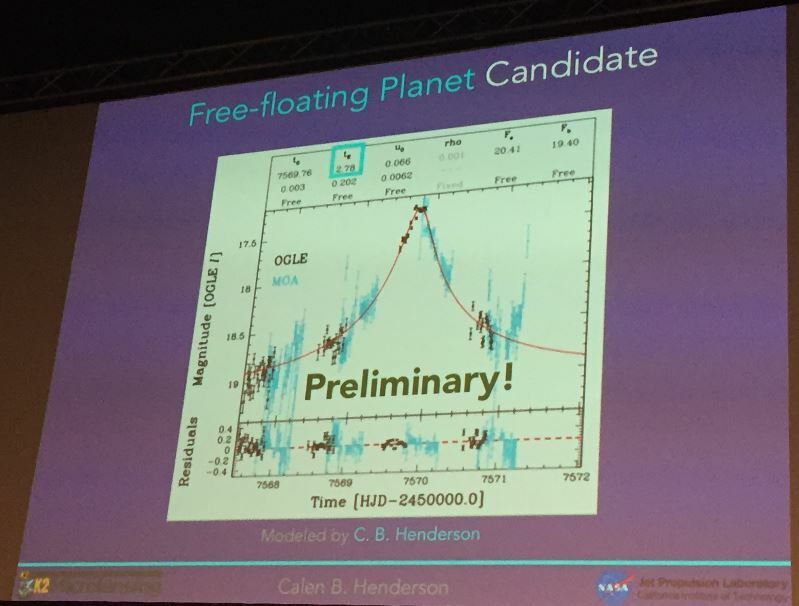 (2016) present the detection of a planet candidate whose orbital period around its host star is one of the shortest known. Identified as EPIC 203533312, this planet candidate goes around its host star in only 4.2 hours. The host star of EPIC 203533312 has 0.73 ± 0.03 times the radius of the Sun and an effective temperature of 4630 K. By measuring how much light EPIC 203533312 obscures when it transits its host star, the planet candidate is found to have 1.92 ± 0.12 times the radius of Earth. EPIC 203533312 is so close to its host star that its density has to be at least 8.9 g/cm³ in order for it to be massive enough for its own self-gravity to keep it from being tidally disrupted by its host star. Power-cycling the onboard computers and subsystems appears to have cleared the problem. Some newly assigned K2-# designations. Pál et al. (2016) "Large size and slow rotation of the trans-Neptunian object (225088) 2007 OR10 discovered from Herschel and K2 observations"
We report the discovery of the exoplanet EPIC212521166 b from K2 photometry orbiting on a 13.8637d period around an old, metal-poor K3 dwarf star. 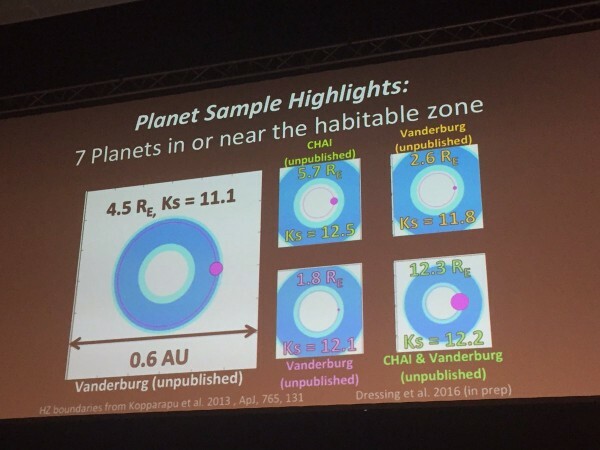 A joint analysis of K2 photometry and high-precision RVs from HARPS reveals it to have a radius of 2.6±0.1R⊕ and a mass of 18.3±2.8M⊕, making it the most massive planet with a sub-Neptune radius (i.e. mini-Neptune) yet found. When accounting for compression, the resulting Earth-like density is best fit by a 0.2M⊕ hydrogen atmosphere over an 18M⊕ Earth-like core, although the planet could also have significant water content. At 0.1AU, even taking into account the old stellar age of 8±3 Gyr, the planet is unlikely to have been significantly affected by EUV evaporation or tides. However the planet likely disc-migrated to its current position making the lack of a thick H2 atmosphere puzzling. With a V-band magnitude of 11.9 it is particularly amenable to follow-up observations, making EPIC-1166 b a rare and extremely important planetary system. Good to have another representative of this interesting class of planets. I must hesitantly warn that the RV data barely covers 2 orbits of the planet (27 days) and only covers ~1/2 of its phase, so if there is another significant source of RV variability this single-keplerian model may significantly misrepresent the mass of the planet. That is not to detract from the quick and capable efforts of the authors, however, and I commend the rapid acquisition of RVs. We report on the discovery and characterization of the transiting planet K2-39b (EPIC 206247743b). With an orbital period of 4.6 days, it is the shortest-period planet orbiting a subgiant star known to date. Such planets are rare, with only a handful of known cases. The reason for this is poorly understood, but may reflect differences in planet occurrence around the relatively high-mass stars that have been surveyed, or may be the result of tidal destruction of such planets. K2-39 is an evolved star with a spectroscopically derived stellar radius and mass of 3.88+0.48−0.42 R⊙ and 1.53+0.13−0.12 M⊙, respectively, and a very close-in transiting planet, with a/R⋆=3.4. Radial velocity (RV) follow-up using the HARPS, FIES and PFS instruments leads to a planetary mass of 50.3+9.7−9.4 M⊕. In combination with a radius measurement of 8.3±1.1 R⊕, this results in a mean planetary density of 0.50+0.29−0.17 g~cm−3. We furthermore discover a long-term RV trend, which may be caused by a long-period planet or stellar companion. Because K2-39b has a short orbital period, its existence makes it seem unlikely that tidal destruction is wholly responsible for the differences in planet populations around subgiant and main-sequence stars. Future monitoring of the transits of this system may enable the detection of period decay and constrain the tidal dissipation rates of subgiant stars. 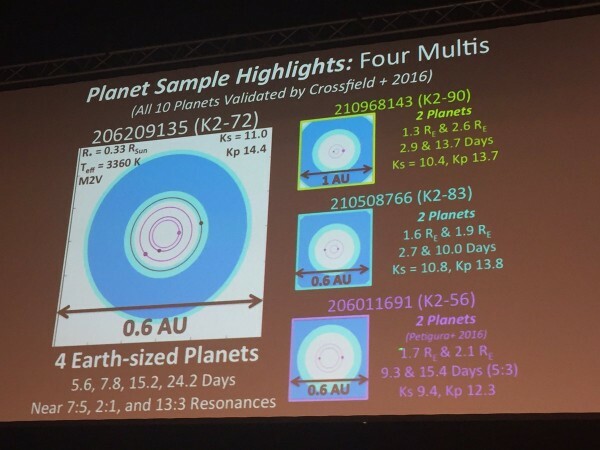 Benjamin J. S. Pope, Hannu Parviainen, Suzanne Aigrain, "Transiting exoplanet candidates from K2 Campaigns 5 and 6"
A super-Earth around a K dwarf near (but not a member of) the Pleaides. A gas giant in a 8 day orbit around a red giant. The planet appears to have been re-inflated by the stellar evolution, suggesting that the inflation mechanism is not a result of delayed contraction and heatloss, but rather an effect determined entirely by the stellar insolation. David et al. (arXiv:1606.06729) "A Neptune-sized transiting planet closely orbiting a 5-10-million-year-old star"
EPIC 201702477 b is a massive brown dwarf. From Davos meeting : preliminary results of K2 campaign 9 !!!!!!!!!!!!!!!! With only two functional reaction wheels, Kepler cannot maintain stable pointing at its original target field and entered a new mode of observation called K2. Our method is based on many years of experience in planet hunting for the CoRoT mission. Due to the unstable pointing, K2 light curves present systematics that are correlated with the target position in the CCD. Therefore, our pipeline also includes a decorrelation of this systematic noise. Our pipeline is optimised for bright stars for which spectroscopic follow-up is possible. We achieve a maximum precision on 6 hours of 6 ppm. The decorrelated light curves are searched for transits with an adapted version of the CoRoT alarm pipeline. We present 172 planetary candidates and 327 eclipsing binary candidates from campaigns 1, 2, 3, 4, 5 and 6 of K2. 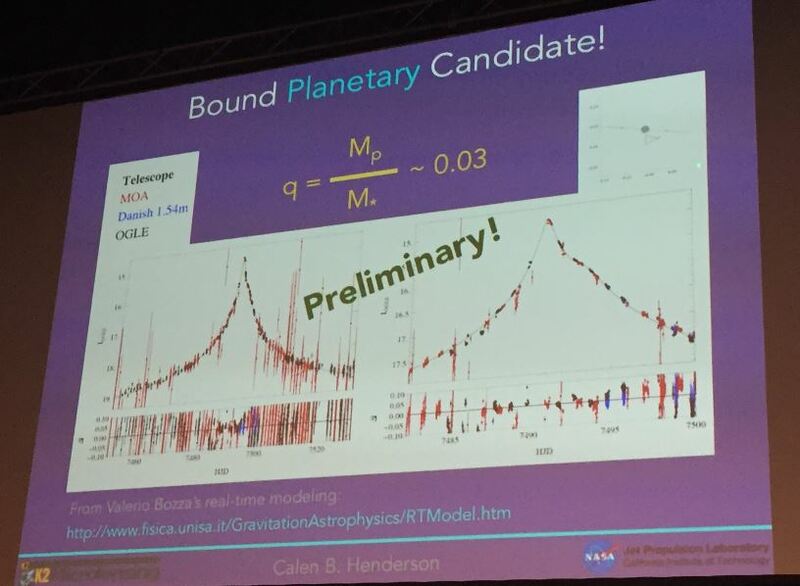 Both the planetary candidates and eclipsing binary candidates lists are made public to promote follow-up studies. The light curves will also be available to the community.